Welp, my laptop is dead, it freezes at the password screen and that's just the end of it. I've gotten a new computer that'll hopefully last as long or longer as my laptop. I'm tired and suffering from a mild migraine at the moment so I'm sorry if this particular review is a bit nonsensical as I am both completely exhausted and caffeinated out of my mind. Of the nine games available at the 2600’s launch there are two that I feel still hold up well today. I’ve already discussed Combat and how absolutely timeless it is, but I need to be in a certain mood to play Combat, and I also need a second player. 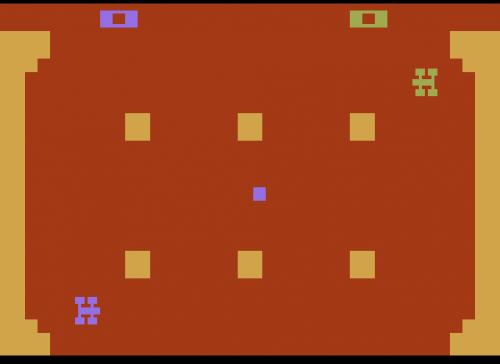 That is the biggest flaw with most of the Launch titles, they’re two player only, Combat, Street Race, Air-Sea Battle, Surround, Video Olympics, and Black Jack are all two player with only Basic Math, Star Ship, and Indy 500 having single player modes to them. I think I’ll talk about Indy 500 today. I love this game; it utilizes my absolute favorite controller on the 2600, and most criminally underutilized, the Driving controller. The Driving controller is basically a Paddle controller that you can spin 360 degrees allowing for the fluidity of a paddle and the maneuverability of a car. Indy 500 won’t win any awards at a beauty contest but that doesn’t matter since you won’t notice the bland graphics after a while. This game relies solely on it’s addictive gameplay, and believe me you won’t be starved for choice. You start off with a basic oval shaped course, just to get you acquainted with the controller, but you’re likely to spend most of your time on the Devil’s Elbow. The Devil’s Elbow looks nothing like an elbow but it is the more entertaining of the two courses on the cartridge, it’s nothing but hairpin corners so you’d better be proficient with your Driving controller if you want to make it around in a timely manner. 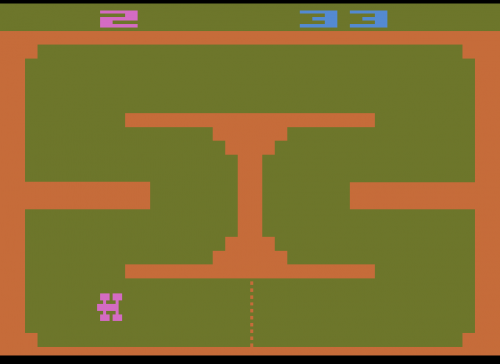 Each of these tracks has a two player mode and a one player timed mode. 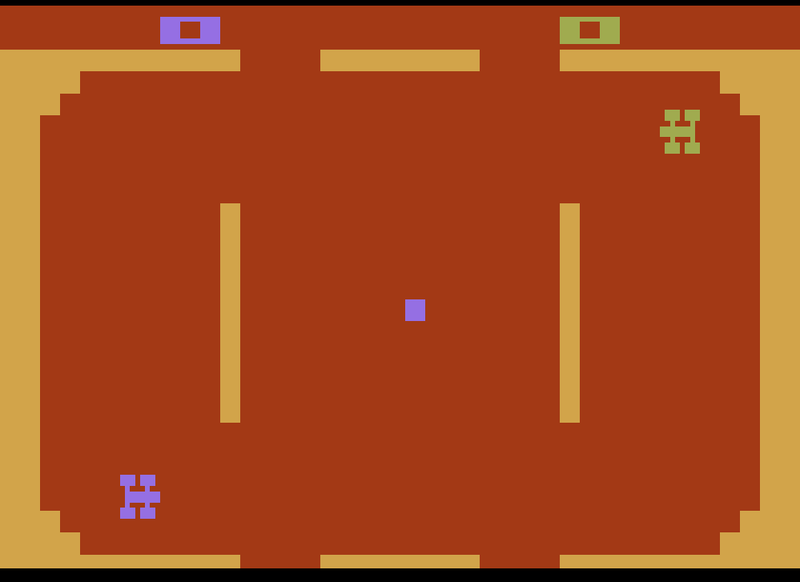 The next mode is Crash n’ Score™ where two players will race around arena-like stages and attempt to crash into a flashing square to get points. 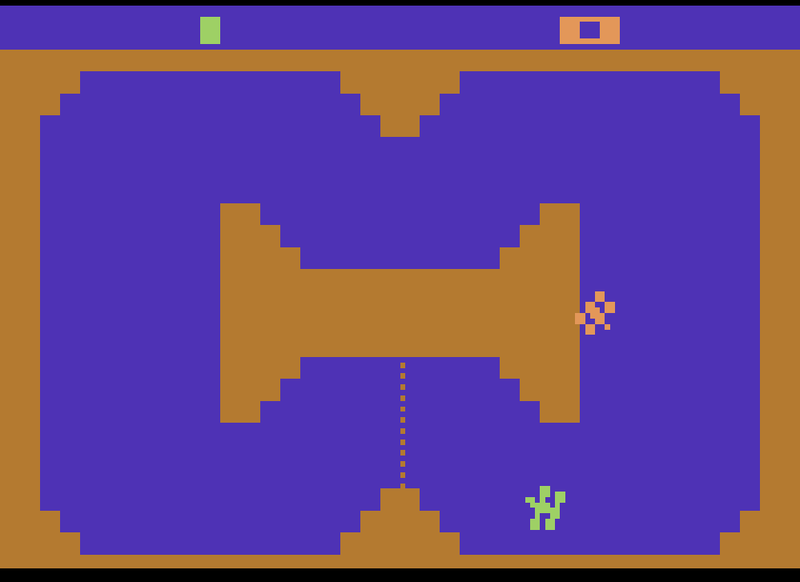 There are two arenas; one is fairly closed in with two thing dividers in the centers and two small escape ports on the top and bottom of the screen. The second arena is far more open, with six squares in a grid in the center and wide open tops and bottoms you’ll have free reign over much of the screen. There are two versions of Crash n’ Score™, Tag and time trial, they are very similar to the race modes from before where you either race each other to a set amount of points or see who can get the most points in sixty seconds. The third mode is Tag™, I think you get the basic gist of that, same arenas, and same version types as the first two. The only twist to Tag™ is that the car that is NOT flashing is it, as opposed to the more commonly assumed opposite; this may lead to some confusion for first time players. The final mode is for those who have completely mastered the basic race modes; Ice Race will surely pose a challenge for even the most experienced players. Ice Race is just the basic Race modes but with almost no friction which will lead to plenty of sick drifts around the hairpins of The Devil’s Elbow. If not even the Ice Race modes can throw you off then I’d suggest putting the switches in Difficulty A for even more speed. Simply that the programmers managed to fit so much variation onto a tiny 2KB cartridge is absolutely astonishing. Indy 500 is a masterpiece of programming and should be held in the highest regards. Since it requires special controllers Indy 500 isn’t especially cheap. You can buy the game loose cheaply all day long, this is a less than five dollar game for sure, but when it comes to the controllers you’ll be shelling out a pretty penny with the cheapest one on Ebay coming in at 13 dollars for just one and 25 dollars for a pair. If you’re feeling excessive you can buy the complete package in the big box, the cheapest of those I’m seeing is around 50 dollars. I settled for a 1977 gatefold variant CIB for ten bucks, seriously there are way too many ways to buy this game. No Collector’s Zone today this is just a damn good game. There's a hack of Sprintmaster that uses the driving controller! Also Asteroids for turning the ship! When I got Indy 500 (in my case, Sears' Race), I thought the ice levels were amazing. I couldn't figure out how they made the cars slide around like that. Personally I prefer the 'Race' Artwork to the Indy 500 artwork. Actually in general I find the Sears boxes to be more pleasing to the eye, I guess I just like the uniformity of them.